These helpful diagrams and explanations will show you how two popular types of faucets—cartridge and ball faucets—work. 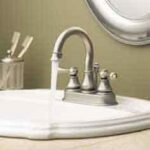 Two of the most common types of faucets on the market today are cartridge and ball faucets. Cartridge faucets have a hollow metal or plastic cartridge insert that seals against the spout or faucet body. Depending on how a series of holes in the cartridge align with the stem, water is mixed and controlled. Drips usually mean the cartridge needs replacing. Cartridge faucets are referred to as “washerless” because they control flow using methods other than a washer and valve seat (though they do have O-rings and seals to prevent leaking). Moen makes a washerless single-handle faucet with a hollow plastic-and-brass cartridge insert that seals against the inside of the faucet body with O-rings. Water flow is controlled by an up-and-down movement of the cartridge; to change water temperature, you just rotate the handle. 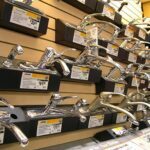 Though faucets are available from a low of about $30 to high-end models in the $600 range, most are medium priced at from $60 to $175. 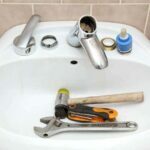 These faucets are very reliable—leaks are generally due to simple O-ring failure. 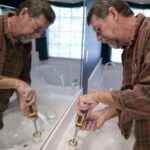 If cartridges ever require replacement, they cost from about $9 to $20, although new Eljer and Moen faucets carry a limited lifetime warranty against leaks and drips. Ball faucets have a single lever that operates a rotating, slotted metal ball. The slots in this ball align with hot and cold water inlet seats in the faucet body to regulate the amount of incoming water allowed to reach the mixing spout.